Last night, I went to the gym a little later than I usually do; that, paired with the fact that most people aren't on campus for spring break, meant that the gym was pretty empty. It was kind of nice, to be honest - I worked out in the main area with the TVs (I usually use the one random elliptical above the basketball courts) and had to stop myself from working out too much because I had an awful lot of energy. I think it was the combined excitement of a lovely day with nice weather (spring is coming!) and being on vacation. Something I have a really hard time explaining to people (and even really understanding myself) is that when looking in the mirror, I can't always tell that I have lost weight. And I mean any of it: sometimes I look in the mirror and I still see 345 pound Mary looking back at me. My dad said it's probably because I see myself in the mirror every day, so the gradual changes aren't as drastic to me. It's not just that they aren't drastic - some days, I can't see it at all. It's really, really strange and hard to describe, and I try not to talk about it too much because it's usually met with comments like "Oh! No way! I can totally tell! You look so great!!!" Because that's exactly my point - you can totally tell, but I can't. I'm not fishing for compliments - I'm honestly just aching to see what you see. Lately, I've been taking pictures of myself almost every day - I'm trying to redefine my mental picture of myself as this smaller person, still in transition but not nearly as big as she used to be. All the pictures I have of myself since high school are all a 300+ pound version of me, and it's so hard to look at them. I'm getting better at not feeling sad or regretful - that girl did great things. And I'm still that girl - just whittled down a bit. It brings me back to the image of the Russian nesting dolls that I'm getting for my weight loss tattoo - there is something completely beautiful, and inside there is something that is just as lovely and wonderful, only a little smaller. So, here you go: my picture from last night. My hair is frizzy from having just worked out like a madwoman, and my shirt is wrinkly because it's huge on me now so I had to secure it behind my back to show my shape a little better for the picture. But these things hardly matter. I love this picture because even I can see that I've physically changed. There's definition in my arms. My stomach doesn't protrude out past my chest. My legs are thinner - especially my calves and ankles. And my curves! I have some. And they're nice. PHU-NOMENAL!!! You've come so far! You look fantastic! Go, gal! GO! P.S. I completely comprehend the whole "you can see it, but I can't" thing. It's like we can't visually accept the changes that have happened because we still feel the same weight we were when we started. Good job on trying to reprogram your mind to appreciate how much you've lost and how much your body changed. I think that is sometimes harder than losing the weight! GOOD FOR YOU!!!! I feel you on the cuves business!!! I was a stack of inner tubes for so long I had no idea these curves were under here. I have a waist and my booty is starting to take shape as well!!! Great NSV for you this week. =) Have fun in St. Louis! You look great, and I think every person can relate to the "you can see it, but I can't." I think one thing to try is to get a new work out top that fits you, that way your not hiding under clothes that are too big for you. You really look amazing and I'm glad you're starting to see that too! It's almost like you're a different person! Keep up the hard work! A lot of people who were significantly overweight still see themselves that way even when others don't. It's sad and frustrating, but over time your mind will change and you'll begin seeing the real you. i'm totally there with not being able to see it. jim and other folks tell me all the time "you're disappearing!" and i just don't see it. rationally i know it's true, but when i look in the mirror i don't look any different to myself. so i've been thinking of doing more pictures as well - i think your idea is right to use pictures to re-form one's self image (i.e., how one sees one's self) and to start taking more pride in what i have accomplished to date. Awesome pictures!!! 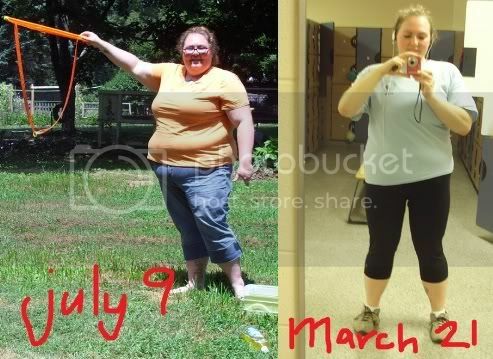 That is an amazing transformation! I so get what your saying about not being able to see the new outside you! My highest ever was 282, and now I'm 229, but I don't see much of a difference but there must be one, right?! But, oh my, I can so see the change in you! INCREDIBLE!! You've accomplished so much!!! I do understand completely. I look in the mirror and can't really notice any changes. I get on the scale and see a lower weight, see my measurements are shrinking but I feel like I look the same most of the time. I like to take pictures so I can compare myself now to when I started. Then I can see the big picture and see I really have changed. You are doing so well, you are really an inspiration. Your legs are getting very shapely, your ankles look tiny. I'm sure you notice that when you shave or are starting at your feet on the elliptical. I can relate to this post a lot. I think I look the same despite losing over 2 stone in weight yet people say I look a lot slimmer. I know I feel a lot fitter than I did 5 months ago but sometimes I forget that I am fitter and I convince myself that I can't do something when I probably can. LOVE these photos~sooo inspiring! AND I LOVE matryoshka dolls!!!!! Love the side-by-side. You look GREAT!!! :) Keep up the awesome work, lady. WHOA! What a difference! Love your nesting dolls analogy; it's so true. Just found your blog and it's amazing how much you changed in such a short time!! keep up the good work honey! Congratulations on your transformation so far :) You look amazing!